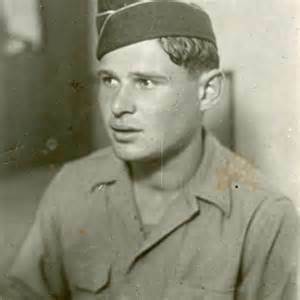 This is a picture of Paul Argiewicz used by the Wisconsin Veterans Museum but with no description. Considering he’s wearing a US Army cap it has to be from after 1950, which would make him over 25 years of age. Remember Paul Argiewicz? He’s the guy I wrote about here because it’s widely claimed he’s in the Famous Buchenwald Liberation Photo, which he is not. But there are a lot of things wrong with the Paul Argiewicz story – claiming he is in that photo is just one of them. Christine Miller has observed that being forced to believe holocaust survivor’s stories has made Western man irrational. Paul’s story is as irrational as any, especially when it comes to the simple act of adding together two-digit numbers. So let’s start there. Paul’s date of birth is always given as Aug. 6, 1925 in Bielsko, Poland. He grew up using his mother’s name, Argiewicz, because his parents were not formally or officially married. The family included two older sisters. He told interviewers that he only went three and a half years to grade school. He was arrested in 1941 by his own reckoning, when he would have been 16 years old. So what’s going on with this man? And with his family and biographer? Can’t they add? It’s apparent that holocaust survivors have become so complacent in believing anything will pass that they actually believe “anything will pass.” Even to the point that if you’re born in 1925 you can be 11 years old in 1941. Think about it. The year of Paul’s arrest is not always mentioned as it is here, but we all know the camps were liberated in 1945, and we know he turned 20 in that year. Precisely, he was 19 on April 11, 1945, four months shy of his 20th birthday … not 14. 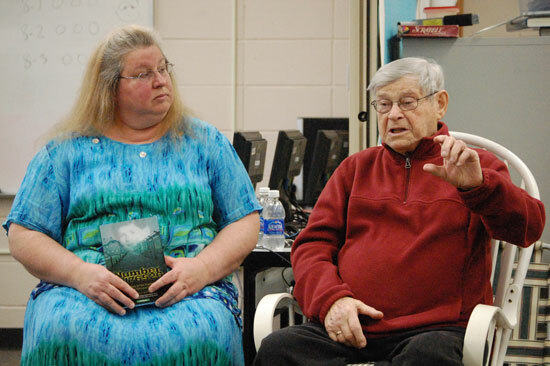 Deanne Joseph Ebner (left) who wrote the book “Number 176520: The Story of Paul Argiewicz ”A Teenage Holocaust Survivor” appeared with Argiewicz in 2012 at Riverview School. Did anyone die midway in the six day train ride with no food/water? I’m by no means doubting, just asking a question. As someone has mentioned below, you CAN survive without water for about a week. God forbid these young people should doubt anything said by a holy survivor, no matter how unconnected to reality. The “survivor” answered he didn’t recall any deaths. But the point being, we don’t ask questions – we’re ashamed or afraid to question – and it leads to utter nonsense. After doing more than a bit of research into Paul Argiewicz, I’ve come to the conclusion that there is also a felt need by him to gain as much sympathy as possible from being a tender 11 years of age to avoid what may be legitimate questions about what he actually did during that 4-5 years in German camps. I’m quite sure that Paul was never starved nor even mistreated during his time in the camps. He was more likely quite the collaborator. 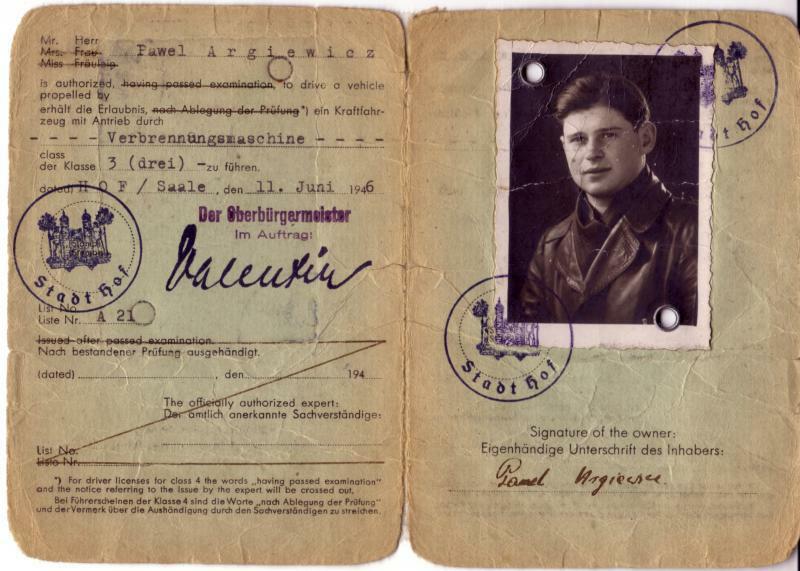 The photo on his German drivers license dated June 1946, only one year after liberation, shows a healthy young man with no sign of having endured any trauma whatsoever. He’s wearing an expensive leather jacket or coat and looks untroubled and at peace with himself. German Drivers License issued to Paul Angiewicz in June 1946. He was obviously living in Germany at the time and looking prosperous. 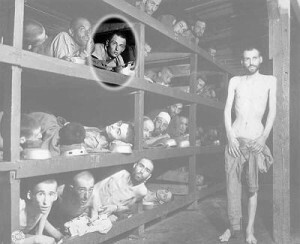 The same craving for attention also accounts for his willingness to falsely identify himself in the Famous Buchenwald Liberation Photo. Argiewicz named himself as the person 3rd from the left in the 3rd bunk up from the bottom in 2008, the same year his book came out. Everyone in that photo is self-identified, and it began after Elie Wiesel identified himself in it in 1983. Before that, no one was identified. After research by a number of people, including myself, it turns out the only correctly identified person is 16-year old Michael (Nikolaus) Grüner in the lower left. Even Argiewicz’ nephew, Murray Matzner, says his uncle is not in the picture, but excuses his uncle’s lies with the charge that he was under the influence of the woman who wrote the book about him, Deanne I. Joseph. Matzner wrote a comment at Scrapbookpages Blog in 2015 to a post that originally appeared in 2010. It is obvious that my uncle Paul Argiewicz is not the person indicated in the photo. It looks nothing like him, and is in fact proved not to be him in his own memoir book photo on the opposite page where a drivers license photo one year later does not resemble this face at all. In particular, he did not have eyebrows that curved so far around his eyes. The assertion that he is present in this photo was nonexistent until 2008, the year his memoir book was published. Since his ghost written book gets so very many facts and stories wrong, as the website associated with book sales also does, and stains a courageous man of integrity who is greatly missed because he is no longer with us, it appears that the false assertion is associated with the factually compromised book. I have also seen a photo where it is the man one bunk lower, and to the left, a sleeping man facing away from the camera, who is indicated as my uncle with a vertical arrow. I don’t know what it is with this photo. The individual indicated as Mr. Wiesel appears to have a receding hairline although a published image of him at age 15 prior to deportation does not have such a hairline. I believe that neither he or my uncle appear in the photo, and it appears to me that at least in the case of my uncle, that it was someone else pushing for him to be present. My uncle was a wonderful, warm, caring, courageous, person who inspired so many with his exceptional love of life and people… but he isn’t in this photograph. RIP, uncle. Your love lives on. Okay Murray, except that Paul was photographed at one of his gatherings holding a blow-up of the famous photograph, indicating that he certainly wanted people to believe that he was in the picture. He, and maybe more so his wife Sheryl have been fully engaged in that fantasy. Lucy Argiewicz Matzner (Paul’s “beloved” sister), her son Murray and husband Robert. Murray’s father, Robert Matzner, (left) who married Paul’s sister Lucy, was born in 1926 in the same Polish town of Bielsko. He has written his own holocaust memoir, titled Prisoner 19053. I wonder how many falsehoods that book contains? Hopefully not as many as Paul’s. But I think Murray may be trying to keep peace in the family by blaming the falsehoods in Paul’s book on the author. 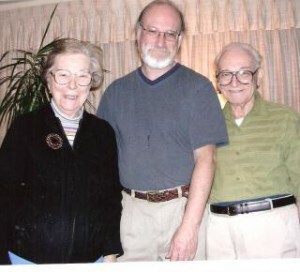 Clearly, Paul’s wife Sheryl had a lot to do with the writing of the book, and the three are often pictured attending book-promotion meetings together. Every story in this book is documented in numerous recordings, CDs, and videos as coming from Paul Argiewicz himself – his face, his words, his voice. 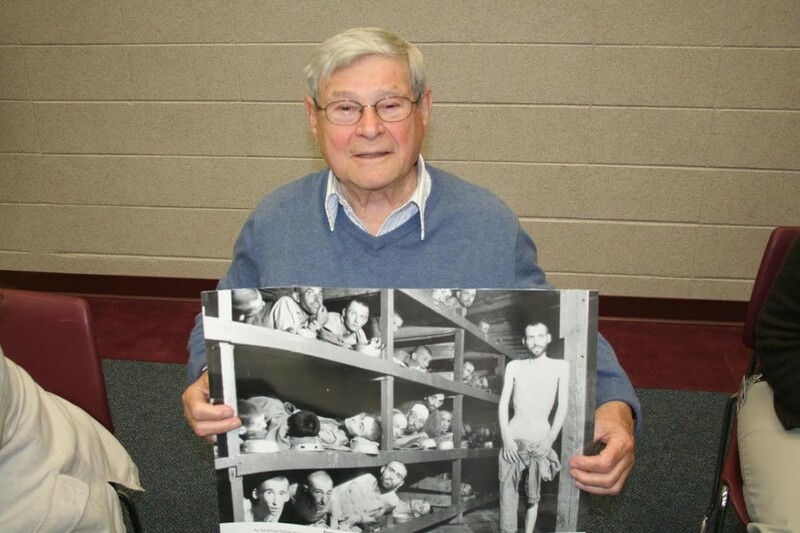 It is Paul’s account of what happened to him as a young boy in the Nazi concentration camps. Anyone who knew Paul, loved Paul, was inspired by Paul, and truly desires to protect the memory of Paul Argiewicz will boldly stand witness against the frauds of the world (be they Holocaust deniers, anti-Semites, or vindictive relatives). All of the above-mentioned records of Paul’s testimony will soon be posted online. Be watching. May the evil ones be silenced by their own arrogance. Yes, it takes guts indeed to stand up against holocaust lies, Dave. Maybe someday you’ll be able to do it. But now take a look at this from stepdaughter Cindy to see who is pushing Paul’s false story. This famous photograph was taken a few days after the liberation of Buchenwald and appeared on the cover of a popular national magazine in the 1960s. Paul is pictured (circled) here on the third bunk from the bottom, the third person from the left (with his food bowl that doubled as a pillow). Cindy, Owner and Founder of Sunless Expressions is the step daughter of a man with an astounding and miraculous life story. Paul Argiewicz was an eleven year old child in 1941 when he was arrested in Poland by two Nazi SS officers. His crime? Paul had stolen two loaves of bread to take to his starving family in the Jewish ghetto. Separated from his family and everything he loved, he would spend the next four years of his young life working as a slave laborer in seven different concentration camps. From Auschwitz to Blechhammer, Gross Rosen, and Buchenwald, Argiewicz; defied all odds by surviving one of modern history’s most unimaginable atrocities against humanity: the Holocaust. 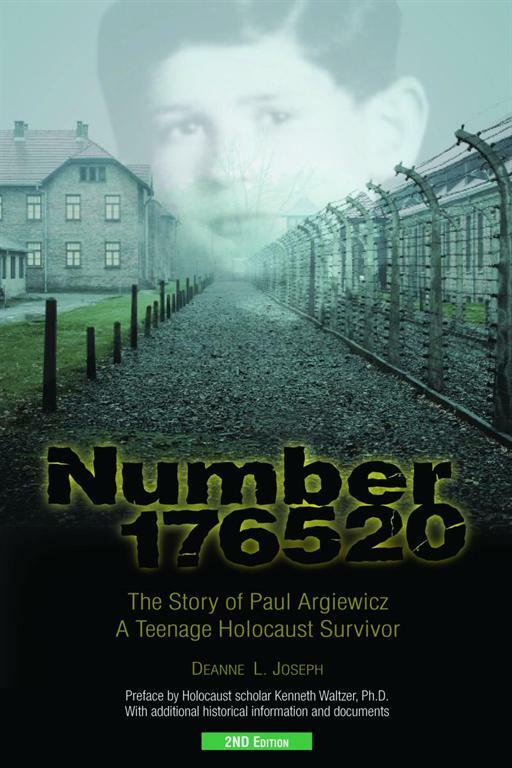 Sunless Expressions is proud to recommend Number 176520 ~ The Story of Paul Argiewicz, a Teenage Holocaust Survivor. With over 16 pages of full-color photos, original camp documents, and other visuals, Number 176520 has quickly become a highly revered and sought-after Holocaust resource in schools, bookstores, libraries, museums, and homes. Visit www.paulsstory.com to purchase and/or learn more about the book that has been inspiring countless readers around the world. We regretfully announce Paul passed away December 11, 2013. Paul’s last public appearance before his death was on April 29, 2013 at the U.S. Holocaust Museum’s 20th Anniversary Ceremony with speakers Elie Wiesel and Bill Clinton. Here he is photographed with his wife Sheryl and grandson Jordan, who are active in furthering the mythical version of his life. In another photo he is showing off his Auschwitz tattoo “176520,” as they were all doing that night (except for Wiesel, of course). Yes, they were there, but what they did or did not experience cannot be proven by a tattoo. At Scrapbookpages Blog, the blogger wrote in March 2010: “Argiewicz says that he had an advantage because he could speak fluent German since his mother was from Bavaria, a state in Germany.” Of course, we know his mother and father were both Polish, and Ms. Joseph comes up with a different story: That Paul associated with Gentile youths when he snuck out of the ghetto every other night for a year (!) and learned German that way. But weren’t there Poles along with Germans outside of the ghetto? This is not explained, of course, but left to your imagination. Apparently a German baker and his children just loved little Paul and gave him bread and German lessons too. Look how dishonest the book cover is. Paul was not a young child in the camps but 16 to 19 years old. He wasn’t even in Auschwitz except for 2 days, then, according to him, sent to Blechhammer, and spent the last 4 months at Buchenwald. The preface to the book is written by our old friend, Professor Kenneth Waltzer, and in it he gives “historical documentation.” I would really like to see that. I should order the book and write more about this later; the only thing that stops me is that you and I both know there is no end to this stuff. One thing leads to another. So we’ll see, but for now, enjoy this excerpt. You will notice that not a single person has a name except Paul. Deanne L. Joseph’s moving new memoir, Number 176520 –The Story of Paul Argiewicz, a Teenage Holocaust Survivor, poignantly recounts one child’s journey through the terrors. With a preface and historical documentation provided by renowned Holocaust scholar, Professor Kenneth Waltzer (Director of Jewish Studies, Michigan State University), Number 176520 is quickly becoming an invaluable resource for students of the Holocaust. Being the gregarious child that he was, he made friends with some gentile children on the “outside.” They did not seem to mind that he was Jewish, and some of their parents even tried to help him in small ways. The father of one of his new friends owned a bakery. The man’s sympathetic conscience obliged him to turn a blind eye, allowing Paul to steal freshly baked bread from his store twice a week. The ritual continued for a year. Sometimes the determined young scavenger managed to find potato peels or other small provisions of vegetables and was always faithful to rush his smuggled goods back to his hungry family behind the fence. Eventually, Paul became so comfortable in his excursions that he inadvertently lowered his guard and came face to face with disaster. Returning to his family with a pair of stolen loaves of bread, he was approached by two SS officers. “Where did you get that bread?” they demanded. Paul had never been so close to the enemy. He stood, accused and frozen. “Come with us!” The order was stern and curt. They snatched the bread from his hands. The pounding of his heart intensified until he thought it would surely break through his chest. He could barely breathe. He felt a hard, squeezing pressure on his arm — the grip of a Nazi. He had the sensation of walking very quickly, although he was unable to feel his legs. Were his feet touching the ground? Were they even moving? He heard only the sound of the officers’ boots clacking with each step on the hard street beneath their feet. His eyes burned as if on fire, and blurred images of his family flashed through his rattled brain. What would they think? Would he ever see them again? Were these men going to kill him? Paul fought to restrain the tears pooling in his eyes. He was only a child — his life was supposed to be ahead of him, not behind. They arrived at their destination: an old schoolhouse that had been converted into a transitory evaluation and detainment center, the Durkankslager. He was taken downstairs to the basement, the “dungeon.” It was filled with people standing in lines. Everywhere were the familiar Jewish identification patches. The Nazis pushed him into place with the others. He looked around at the detainees, predominantly grown men. He did not see any other children in the crowded space. An SS officer sat upright on a stool at the front of the room, one leg raised and bent at the knee with his booted foot confidently perched on a table. Behind him was a desk filled with papers. As each of the accused men made his way to the front of the line, he was questioned by the man on the stool, evaluated, and sent into a group either to the right or to the left. Paul was not sure why the men were being divided, but as he drew closer to the evaluating officer, he was overcome with a sense of doom. His mind fired rapid, disconnected thoughts. I’m only a child . . . perhaps if I tell them I’m only 11 years old . . . maybe they will have pity and let me go back to my parents. Without warning, a man behind him in the line kicked the back of his leg. He leaned into Paul’s ear and spoke quietly but firmly. How did he know what I was thinking? Paul wondered. The words rolled off his lips in perfect Bavarian German. The officer looked up. His dusky eyes examined the youth before him. His brow furrowed, and he observed the boy for a moment. Paul felt as though he had been suspended in space and time. The moment seemed to last an eternity. Surely, he was exposed . . . guilty . . . he had lied . . . to an SS officer! The penalty for such an offense was execution. “You speak German?” The officer seemed amused. “Yes,” he responded once more in the language he had learned from his playmates. “You speak with a Bavarian accent. Why?” “My mother is from Bavaria,” he lied again. For another endless moment, the man’s eyes pierced him. Paul was able to manage a convincing expression. Finally, the harshness of the Nazi’s sharply featured face faded, yielding to a smile and a chuckle. “Go over there,” he said, nodding his head to his left. Paul moved in the direction of the nod, but he did not understand the purpose of separating the men. Would he be sent to work or to the grave? None of the men seemed to know the fate that awaited them. They remained in the detainment center for a few more days. Each day they were given small rations of bread and a cup of water. Paul allowed his mind to escape into a place of refuge and peace. He comforted himself with thoughts of his family, memories of good times they had shared, life in Phella’s beautiful home, and the hope that maybe he would soon be returning there. Paul’s heart raced within him. An overwhelming urge demanded that he jump to his feet and run to the window. He dared not. To do so would jeopardize not only his fate but also now his father’s. Separated by brick and mortar, barbed wire and guns, and the merciless cruelty of the human heart, father and son looked upon each other for the last time. In that sacred moment, they knew that the bond they shared was beyond man’s reach; it was a bond protected and preserved in eternity. Still, the 11-year-old was overcome by the realization that he might never again feel the loving touch of his father’s strong hands or hear the sound of his voice.